Yes, it’s this time of year again and I hope you’re as excited as I am! For this special spooky day, I wanted to share one of my favorite costumes I ever got to make/wear – it was even recognized by LAUREN CONRAD and her team! 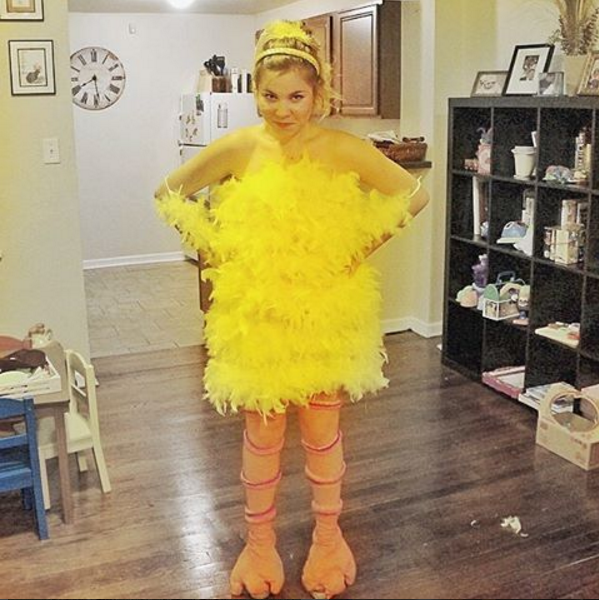 I’m talking about a DIY Big Bird Halloween Costume and well, it’s safe to say it was a hit everywhere I went! 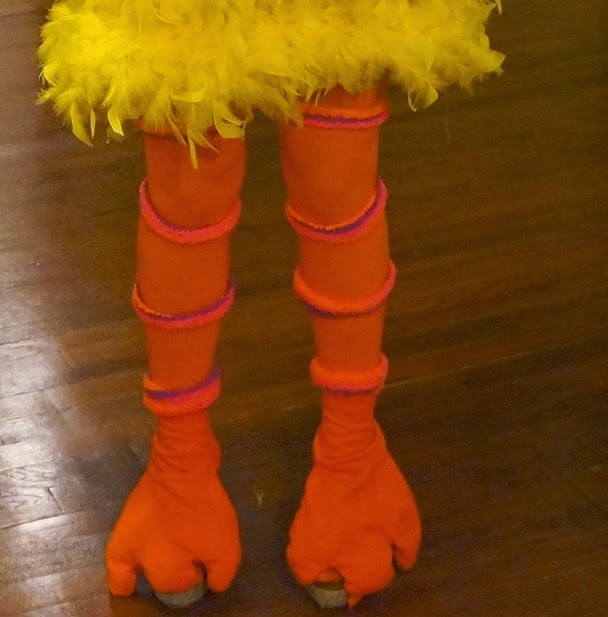 This Sesame Street costume took a little bit of planning (NOTE: those yellow feather boas can get a bit pricey, so I recommend buying them in advance from Amazon or eBay to save money), but I couldn’t be happier with results! 1. Buy a cheap yellow dress; I found mine at Goodwill. It was a perfect sleeveless dress with a strap going around a neck. I cut off the strap and used it later to make gloves for bird’s arms. 2. 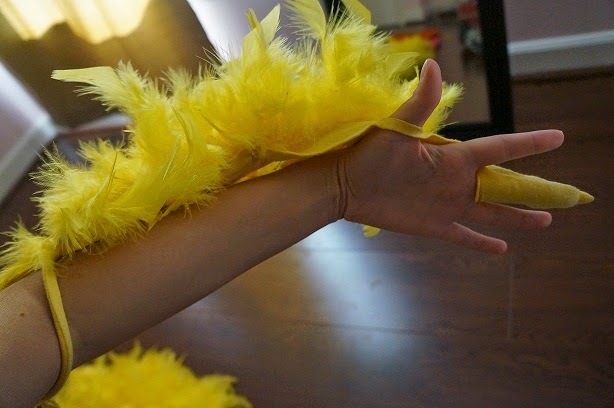 Take your yellow feather boas and saw them together around the dress. 3. Make sure you thoroughly cover the whole dress. 1. 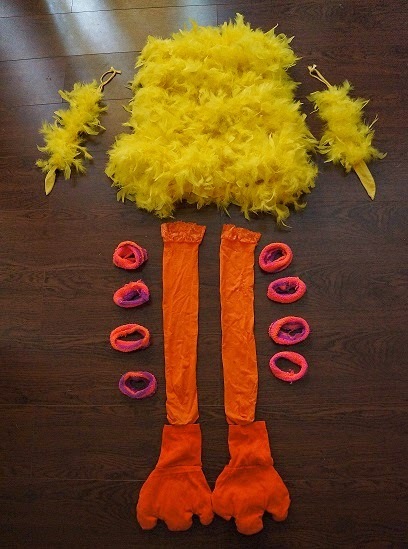 I was lucky to have additional material from the dress and decided to use it for big bird’s arms. 2. I simply cut two long stripes, made a hole for my fingers and tied the whole thing around my arms. 3. I covered it with some leftover feathers. 1. I got my orange high thigh socks from Amazon. If you prefer, you can buy orange tights. 2. For the stripes going around bird’s legs, I simply cut the colorful furry socks (bought at Walmart) into stripes creating circles (just like rubber band or hair ties) that will easily stay on your legs. You will need about four stripes for each leg. 3. You can find another way to make your pink/ purple stripes. The reason I used furry socks is because they won’t cut off any blood pressure on your legs. 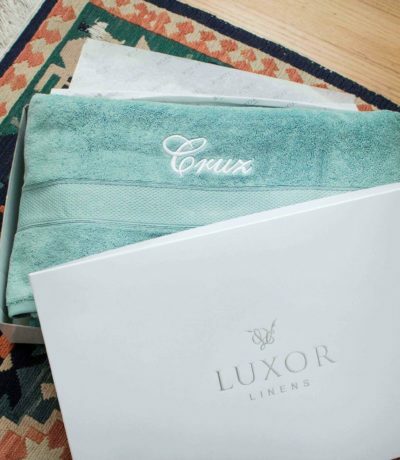 Make sure you find something that will be comfortable and save to wear around your legs. 1. Cut sleeves off the shirt to use them as a layer on top of bird’s feet. 2. 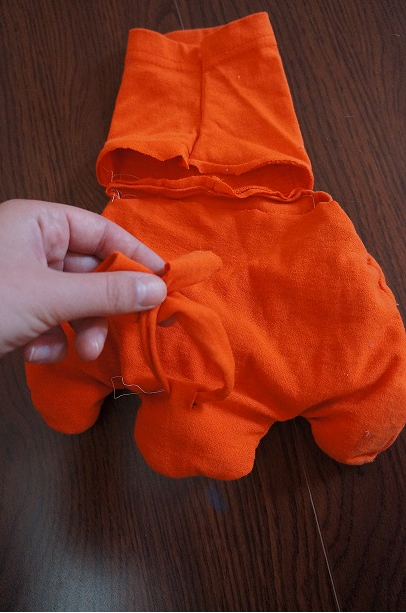 Then cut out a shape of bird’s feet (3 fingers) from the rest of your orange shirt. 3. Make sure you cut out 4 samples of those fingers. 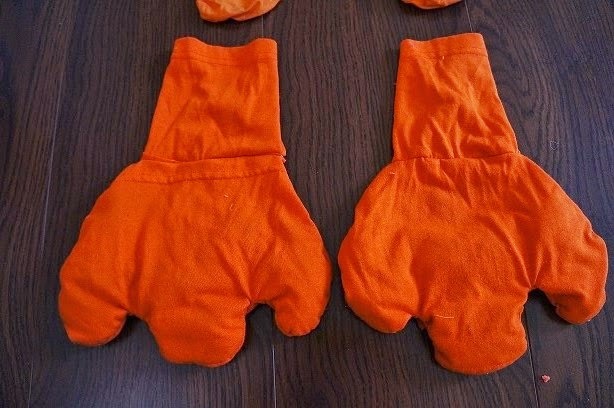 You will need to saw 2 of them together and fill them with the rest of shirt’s material or something of this sort, so the feet look big enough. 4. 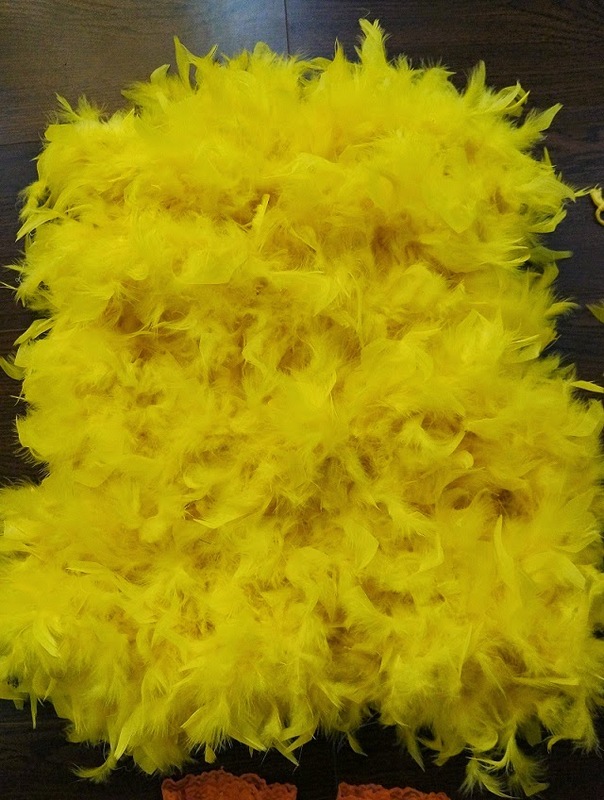 Cut two little holes on the bottom side of the big bird’s foot and put a piece of material through it. This way you will easily tie the feet to your shoes and make sure they will stay in place. 5. At last, saw the top of the feet (that goes around you ankles) together with your bird’s feet. 1. Have fun with your makeup! 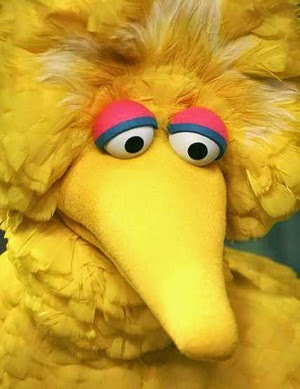 Big Bird’s eyes are blue on the bottom eyelid and pink above. However, I’d say that you can play with it according to what you like. Add some big fake eyelashes, yellow lips, the possibilities are endless! What did you think of this tutorial?! I wore this costume 3 years ago and since then, I still haven’t been able to top it! Knowing that Lauren Conrad appreciated my work as well was a huge honor! 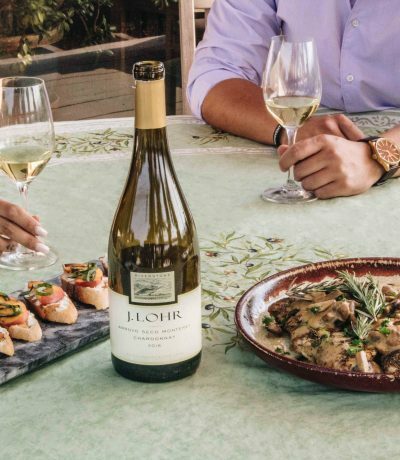 Click the picture below to see my feature on her website. This is so cute!! I love this idea! So original! Thanks, love! Glad you like it!